As promised (though very late and with apologies to my testers), I am sharing pictures of my pattern testers' versions of Magnitudes. As always, the variations astound and delight me! Elaine and Joanne's quilts both conjure visions of fall. Perhaps the summer heat had them both thinking of cooler weather! You can find more of Elaine's beautiful work on her Flickr feed. 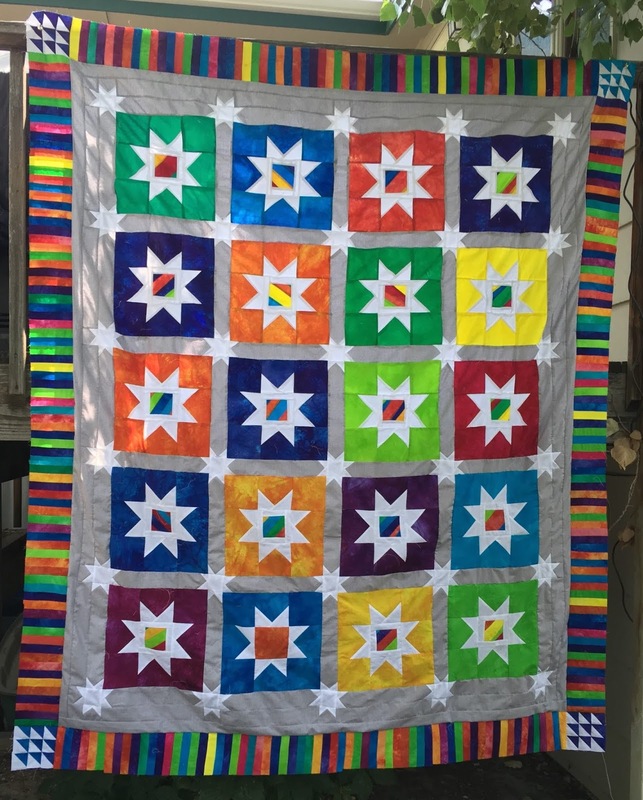 Joanne is a prolific quilter. Sh shares her work on instagram as @turltlequilterjo and on her blog. 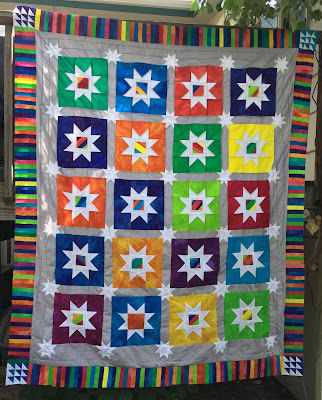 I'm thrilled Sue chose to use her hand dyed fabrics to make her quilt. As you see, she even used up her scraps to add a piano key border. I love to see quilters add their personal touches to my designs. 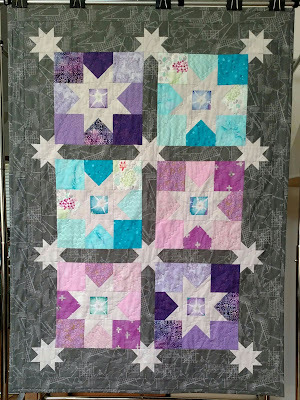 Kathi added extra sparkle by fussy cutting stars for the centers of the large stars in her sweet baby version. See more of Kathi's work on her Facebook page. Next up is my latest version of the quilt. I flipped the fabrics and tried something new with the binding. You won't want to miss it! It's interesting how different the same pattern can look, depending on the color. These are all so pretty. Wow, they are all stunning! It is fun to see each version! All of those aqilts are really pretty, and I'll be looking forward to your latest version. 'All your testers did a great job! I love the piano keys border! ---"Love"
Lovely versions of a lovely pattern! Each quilter has definitely personalised your design and made a memorable quilt.